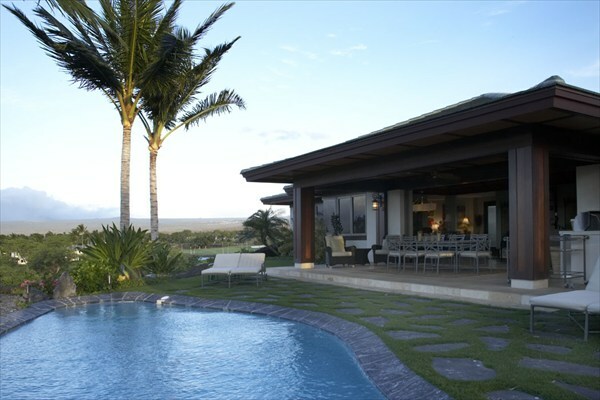 Come home to your own tropical paradise and enjoy the best of island life from the comforts of Puako! Puako, the only oceanfront community along the Kohala Coast has retained the feel of a beachfront community from years gone by. It is one of the best-kept secrets on the Big Island! No gated communities, no association fees, just good island living at it’s finest. Steps away from the white sand beaches of Puako, this island style home features a Hawaiiana motif throughout. With 5 bedrooms, each of which has its own bathroom, along with a great outdoor space for entertaining, this home is designed and fully set up for bed-and-breakfast operations, a corporate retreat, or, as a home for your extended family. Enjoy the colorful tropical landscaping and fresh mango, papaya, lemons and limes you can harvest right from your shaded, private yard. Attractions include outdoor stone showers, an outdoor dining area, an updated kitchen with granite countertops, and beautiful hardwood floors (koa, ohia, robusta, and milo). Previously featured in Travel and Leisure Magazine, this attractive island home has won hospitality and quality awards as a successful bed-and-breakfast, with a dedicated repeat clientele. Must see to truly appreciate! This fabulous property boasts spectacular ocean and five mountain views. Situated in one of the most desirable locations within the gated community of Waikii Ranch, the home rests at about 4200ft elevation. The Frank Lloyd Wright-inspired design features a lava rock and old growth redwood exterior, slate terraces and 108 exterior windows and doors that allow in an abundance of natural light. Ash wood trim, high ceilings and oak flooring highlight the interior throughout. The living room opens to the second floor as does the kitchen, which is complete with custom cabinets, high-end appliances, Corian countertops and a quaint breakfast nook. Other features include a sound system, fireplace, central heating, air conditioning, central vac and a large garage. The spacious second floor room serves perfectly as a play room, media room, fourth bedroom or any combination of these. Also, a separate 1,602sqft stable includes a studio apartment, 2 horse stalls, a tack room and another large garage. Located just 15 minutes from Waimea and 30 minutes from the coast, Waikii Ranch is Hawaii’s finest ranch community with extensive riding and walking trails, a clubhouse, tennis court, workout facility, polo field and rodeo arena. Here is the link to the 2011 Waikoloa Village Market Report. In this post I am addressing the Home segment but there are links to land and condo sales, feel free to call me about these segments if you are interested. The links lead you to an interactive report. Clicking on the icons and underlined numbers connect you to photos, virtual tours and property details. Golf Course Ocean View for how much???!! Just had to share this sweet property at an even sweeter price. Up on the slopes of Mauna Kea is my little home town of Waikoloa Village. Residents, especially property owners, enjoy the golf course, pool and tennis courts. Waikoloa Elementary and Middle School, Highlands Shopping Center with its bank, credit union, doctor, dentist beside many other businesses and services make this community that is home to lots of nice neighbors a very convenient place to live. Friday I had the opportunity to visit this absolutely great deal, MLS #250682 , Unit #A106 at Waikoloa Villas. It is a clean and neat one bedroom along the Waikoloa Village Robert Trent Jones Jr. Golf Course with an extra bonus of ocean views. You can watch the sunset from the lanai for the rest of your life for only $138,000 (fee simple) plus MaiTai supplies. Home owner fees are $425/month for 2012. Call me at 936-4640 if you want to take a look. Hear the unit next door, a 2-bedroom, will soon be listed at $249,000. Waikoloa Village on the beautiful Big Island of Hawaii!